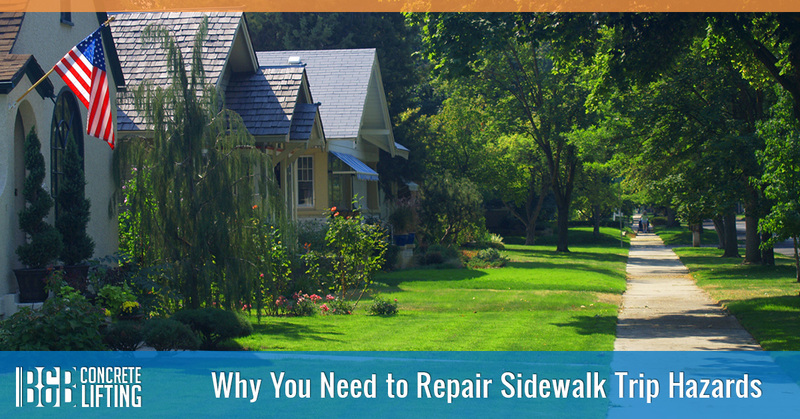 Maybe you live in a neighborhood without a lot of foot traffic or maybe you aren’t too concerned with the way your sidewalk looks because you don’t spend a lot of time out front. Whatever the reason you have for letting your sidewalk start to sink, you should take care of it sooner rather than later. In this blog, we will talk about why concrete slabs start to sink, how to fix it, and why it can potentially save you a lot of money to repair your concrete. If you need a company that has years of experience repairing and lifting concrete, call B & B Concrete in the St. Charles and Fox Valley area. Why is My Sidewalk Sinking? Sinking concrete is usually a gradual process so it might take quite a bit of time to notice that something is wrong. What is occurring underneath your slabs can be attributed to one of several causes. The first possibility is due to underground erosion. Erosion is the process where material is, over time, removed from one area and carried to another by water. If the area around your sidewalk wasn’t set up for proper drainage or if the company who poured the slab didn’t adequately compact the soil, it is possible that much of the material under your slab has washed away. The second possibility is that the soil under your slabs has become very compacted in certain places. This can happen when there is a large amount of weight resting on a section of material that is looser than the material around it or if it wasn’t properly compacted. Does it Matter if My Sidewalk Sinks? Regardless of the cause, sinking concrete can pose some big problems for your home and the safety of the people who use your sidewalk. Concrete that sinks in one area rises in another, causing tripping hazards. The last thing that you want to deal with is being liable for an injury that occurred on you property, especially when it was caused by something fixable. In addition to being a safety issue, sinking concrete will eventually start to crack and crumble. While the look of your slabs might not be that important to you, if you want to sell your house at any point, broken concrete will lower the amount of money you make. The best way to prevent trip and fall accidents on your property caused by sinking or tilting concrete is to call a concrete lifting company like B & B Concrete Lifting. Our process is much more affordable than having your slabs re-poured and takes a fraction of the time. Because our process addresses the underlying cause of sinking concrete, it is also much more likely to permanently solve the problem than a new slab would. Call us today if you live in the Chicago area and you want your sidewalk to look great and prevent accidents. We are experts at lifting everything from sidewalks to concrete steps to garage floors and we have had great successes that all of our customers have been happy with. Call us today!